eatdinner.org is a non-profit organization dedicated to helping families make the commitment to eat dinner together on a regular basis. 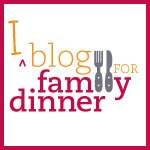 Blog for Family Dinner is one of our initiatives. American families are confronted with many urgent social, economic and health challenges today, including obesity, teenage alcohol and drug use, tight budgets and time constraints. All of this is often made worse by economic concerns and feelings of disconnectedness among family and friends. Family dinner can be a solution to many of these problems. The simple act of having regular family meals has been shown time and again to have positive effects on children, teens, and their parents on a broad range of issues related to social, emotional and physical development. This blog and our social media presence on Facebook and Twitter (@eatdinner) are dedicated to sharing information and resources about how to best support parents, children, health professionals and policymakers to support more family meals for all. I was inspired by Food Revolution Day's theme this year of getting kids worldwide excited about good food. What better way than to get kids in the kitchen cooking, tasting, and learning about delicious real food? I was thrilled to be invited by Brianne DeRosa of Red, Round, and Green and Bettina Siegal of The Lunch Tray to collaborate with other bloggers on a Flipsnack virtual cookbook to celebrate the day. We each had our kids cook up different easy dishes at home and shared our experiences with photos and step-by-step recipes. Here's our story and a fun cookbook for you and your kids to get cooking at home in your own kitchen! Click link to access free cookbook. My daughter loves cooking but in the busy daily rush of making dinner, I often forget to include her. Sometimes I think after the fact, "Oh, she could have really helped with this one. Darn!" I am on a mission to teach my teenage daughter full-scale recipes and meals, but I have to remind myself to capture the energy and enthusiasm of my eight year old while I still can. One afternoon I had hurt my hand and even doing simple tasks in the kitchen was challenging. Perfect time to call in the kids to help! My teenager diced the tomatoes, but my eight year old wanted to make the tomato bruschetta all by herself. With this simple recipe, she could do it! I just told her what to do, step by step, and--viola!--she did it. She was so proud and the result was a kid-friendly, good food snack that can be a quick bite or an appetizer. Another great thing about this recipe is that it can be varied and amended in many ways to suit your budding chef's creativity. Add spices or fresh herbs, lemon juice or use a different cheese (just not too much!). Also, as long as you don't burn the bruschetta in the broiler, it is impossible to "screw up." Some tomatoes fall to the tray, not problem! They'll get roasted too. The rustic look doesn't stop them from getting gobbled up. This delicious snack was made entirely by my 8 year old daughter, except for help with dicing tomatoes and using oven. 1. Set oven to broil (low setting, if possible). 3. Spoon tomatoes over each bread slice, piled high; it’s ok if tomatoes fall off toast as they will be roasted on tray anyway. 4. Sprinkle a bit of salt on each toast and also sprinkle with freshly grated Parmesan cheese. 5. Have adult or older teenager place tray in hot oven and broil for 3-5 minutes. Check to be sure it is not burning. Heat until tomatoes and cheese are lightly browned but not burned. Depending on the temperature of your oven, you may need to add 2-4 additional minutes. 6. Let cool a moment and serve. Any tomatoes that have fallen off can be re-piled onto the toast slices. Enjoy! 7. Optional variations: Add squeeze of lemon juice or a splash of balsamic vinegar to tomatoes and stir prior to spooning on bread. Fresh herbs can be added to tomatoes or sprinkled on finished bruschetta as a garnish. Many thanks to the other great bloggers who contributed to this effort and of course to Food Revolution Day team which is tirelessly working to expand awareness about food choice and to teach and inspire kids and families everywhere to eat good food and to cook for themselves. Have you taken the Family Dinner Challenge? I have been promoting family dinner in this space for several years. I've thought about the hows and the whys, the benefits and the excuses, and the ups, downs, sideways and backwards of family dinner. I've wondered about the best ways to encourage people to give regular family dinners a try: I've quoted statistics and presented independent research. I've linked to recipes and other resources so that people would feel like there was support and help at their fingertips. After all these posts, I can honestly say that I think it comes down to commitment. Simply making a commitment to family dinner, whether it is 3 times a week or every single night. Family dinner is really about setting goals for your family life and following through. Once you can do that, the proof is in the pudding. I find that families who start with the family dinner routine very quickly feel that it is worth the effort. Most families that "do family dinner" just wouldn't have it another way--it's that good. That's why I love Aviva Goldfarb of The Scramble's new Family Dinner Challenge. In September she is encouraging families to sign up and make the commitment to family dinner 3 times a week for 4 weeks. She is hoping to get 10,000 families strong to join in committing to family dinner. It is easy, fast, free and with no commitment, other than the promise you make to yourself! If you already have family dinner 3x a week or more, sign up and join the family dinner community. If you want help and resources to make the commitment for the first time, all the more reason to sign up! There are even some amazing prizes that you could win, but the real winner will be you and your family. In addition to The Scramble, there is an amazing online community that has tips and recipes to help make family dinner a reality. Many of them have signed up as partners to the Family Dinner Challenge: The Family Dinner Book, Bri of Red, Round and Green, Time at the Table, Kia of Today I Ate a Rainbow, Gina of Feeding Our Families, Bettina of The Lunch Tray, Sally of Real Mom Nutrition, and the Kids Cook Monday. Some other favorite resources of mine are listed here. Give family dinner a try; take the Family Dinner Challenge and join thousands of families making the commitment to family dinner this September! You can also show your support for Family Dinner in a ThunderClap online event. Sign up with Twitter or Facebook, or Tumblr and you'll send out a message of support at the same time as thousands of others. It's a great way to call attention to the important of family dinner and the legions of families that are in support of family dinner and each other. School's ending, summer's coming: this time of year is a season of change and is often full of transitions. Honestly, this year for me is so full of transitions that my head is spinning. My son turns 18 in a couple of weeks and will graduate from high school. He will attend college over 1,000 miles away, making his journey away from home very real. My middle daughter is graduating middle school, preparing to enter high school. The distance she will travel is also significant. Instead of a short walk to school on a relatively quiet Brooklyn street, her commute to high school will be via subway to that "big city" in Manhattan. And my mother, who is recently widowed, is planning a reverse-retiree move from Florida to Brooklyn this summer, so as to be closer to her only family, me. All these journeys to and from home, all these big changes, are exciting, but nonetheless a bit scary and unsettling. Change can be hard, especially when the family structure you've been used to for... I don't know, for-EVER, is changing. Add these emotions to the usual end-of-the-year chaos of school picnics, special ceremonies and extra performances, and you've got A LOT GOING ON. Family dinner is the one thing that gets us through these upside-down times. We still try to have dinner together 4 or more nights a week, no matter how busy we get. It really grounds us all and gives us a center. Weeknights are the best times for us to eat together as a family, though mealtimes get shortened because the older kids need to do homework and the youngest must fit in bath and bedtime by a decent hour. We rarely get our 17 year old to the table on Friday or Saturday night anymore because he has usually has plans with friends. This holiday weekend, though, many of his friends were away and it was all five of us at the table with no time pressures or places to run off to. We laughed together, shared a huge bunch of fresh lychee nuts,* and had longer after-dinner conversations than we've enjoyed in a while. Though he would never admit it, I can sense my son is already a bit nostalgic for these family times together. I certainly am. Knowing how much family dinner has meant to me and my children as I approach my 18th year (!) as a parent, I fully support Aviva of The Six O'Clock Scramble in the Family Dinner Challenge. Many of my readers already have regular family dinners, so it's a great way to show the numbers of people who live this lifestyle. For anyone who is interested in making the commitment to family dinner, but need help getting started (or help keeping your efforts going), The Six O'Clock Scramble is offering great resources including a checklist and recipes. Have dinner together at least 3 times a week for 4 weeks by September 2013! * The funny story behind the overwhelming amount of lychee nuts in our house: This holiday weekend we went to Chinatown to have dim sum as a family; it had been ages since our schedules aligned so we could go together. We got separated from my husband at one point because he left something at the restaurant and had to go back. As the kids and I maneuvered through the crowded streets, every vendor seemed to have fresh lychee nuts. The kids begged to get them, and I hesitated because they are quite expensive, but eventually I said, "Sure." Soon after we caught up with my husband; of course he had bought a big bunch of lychee nuts too! We all laughed about it as my middle daughter observed, "I feel like this would only happen in my family!" Anyone have any recipes? Celebrate real food on May 17, 2013 and every day! Join the movement! I have been a big fan of Jamie Oliver's Food Revolution cause since he started the movement in 2010. This year's theme Cook it, Share it, Live it aptly sums up the enthusiasm for real food and it's a prefect metaphor for how family dinners can reinforce all the sentiments of the Read Food Revolution philosophy. When you cook food for yourself and your family, you end up with healthier, fresher food, where you control the ingredients. If you are shopping and planning well, the overall price of better food is usually far less than a prepared food options. SHARE IT: Family meals are not strictly about the food served. It is a time to talk, laugh and bond together as a family. Some research suggests that the conversations that happen around the family table are the key ingredient to a child's success at school and in life. By sharing meals, we remember to slow down and enjoy our loved ones. Food Revolution Day is a good reminder that the dinner table can create a shared community, be it with family or with friends and neighbors. LIVE IT: The Food Revolution is not about a boring, strict regimen of food, with the idea of pushing food that's just "good for you" medicine you have to take. It is about the GOOD LIFE! Real food-- luscious, delicious, fresh and naturally nutritious-- it is the most wonderful stuff in the world and worth celebrating. Join the Food Revolution because you want to embrace the good life! Celebrate Food Revolution Day on May 17th, 2013 with a great real food family dinner. Try some of these great recipes. Check out the Food Revolution website and Facebook page to find special events near you. In preparing a presentation for high school educators recently, I had a "light bulb" moment. Teens are an untapped resource in the family dinner equation. When we think of family dinner, teenagers hardly even enter into the picture. This may be because they have busy schedules, just like their parents, or perhaps parents of teens have already given up on a family table! But the teenager years are a crucial time where family dinner can really help parents and older kids stay connected. Moreover, teens can help make dinner happen -- the Teen Solution to Family Dinner! Kids, teens and adults who have family dinner regularly report feeling more connected, happier and less stressed. This has a special resonance for teens. I was recently shocked and saddened to learn that 1 in 25 teens has attempted suicide and 1 in 8 has had some thoughts of suicide. Teen mood swings are typical, yet teen depression and other mental health problems are a very real threat that parents and educators need to be attuned to. Just the act of having a few meals together, at any time of day, can bring this crucial connection. Family dinner has been shown to be a positive behavioral therapy for teens with eating disorders, substance abuse problems, and other mental health issues. Furthermore, teens actually like having dinner with their families, despite the stereotypes. They appreciate having a regular time with parents and they report eating more healthful foods with the family. As Tara Parker-Pope, reported in The New York Times Well Blog, a few years ago, even people working in the field can forget. The number one complaint from parents about family dinner is the time it takes to put dinner on the table. The light bulb moment came when I read that one of teens' biggest frustrations was that parents did not let them help more in the kitchen! Clearly, this is a potential win-win for parents and teens. Depending on where you live, teens can help shop, prep for, and/or cook dinner for their families, in addition to the more traditional role of cleaning up. Even if it is just once or twice a week, letting your teen take charge of dinner could mean the difference between having dinner together or not. Actually taking responsibility for making the family meal can be a great way to bolster self-confidence and self-esteem. Teens hate doing "busy-work" and may actually be more willing to cook for the family (an important job) rather than taking out the garbage (easier, but a more menial task). The teenage years are an excellent time to learn cooking as a real-life survival skill. Unlike grade school children, where cooking is solely "fun," teenagers will actually be cooking for themselves in just a few years. I cooked dinner for my family while my mom worked nights, and I think that's where my confidence in the kitchen came from. I cooked meals throughout college to save money and was often surprised that other people didn't know how to cook. Though I'm able to make much more sophisticated meals now, I started with serving my mom's pre-made crock-pot dinners and re-heating frozen vegetables. What do you think? Is it possible to have teens or tweens actually make family dinner? Would this help your family eat together more often?